The Caribbean Court of Justice, Belize’s highest appellant court, ruled that the Maya Indigenous People of southern Belize have rights to lands they have customarily used and occupied. The Court affirmed that these traditional land rights constitute property within the meaning of the provisions of the Belize Constitution that generally protect property free from discrimination. After almost a decade of legal struggle, the April 20th judgement finally upholds the rights of the indigenous Maya to their ancestral lands. Grassroots International has supported he Maya Leaders Alliance, a lead plaintiff in the case and community voice for indigenous rights and cultural. “We have been dragged through the courts for over 30 years but today we are happy that the highest Court again stood with the my people to ensure that Belize gets on the right side of history,” said Alfonso Cal the highest traditional leader for all the Maya villages. Cristina Coc, spokesperson for the Maya Leaders Alliance and Toledo Alcaldes Association explained that the Court judgment marks yet another opportunity for Belize to rewrite its relationship with the first peoples of Belize. 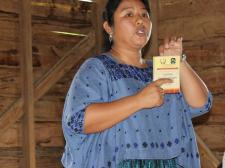 She elaborated that the fight of the Mayapeople is for all grassroots and marginalized peoples in Belize and worldwide. The Court judgement is the culmination of decades of litigation filed against the Government of Belize by the MayaLeaders Alliance and the Toledo Alcaldes Association on behalf of the Maya villages. The Government of Belize in the past has vigorously contested theCourt assertions of Maya Customary land rights. While the major issue of Maya land rights has been settled, outstanding before the Court is the Maya’s claim for compensation for damages. The Court will hear the arguments on damages on Wednesday, April 22. After the Court hearing the Maya People will hold a press conference on this historic judgement at the Best Western Hotel in Belize City. The Maya People’s victory is a victory for all marginalized peoples in Belize and worldwide. NOTE: This document is adapted from a press release of the Maya Leaders Alliance. For more information, contact mayaleadersbelize@gmail.com.